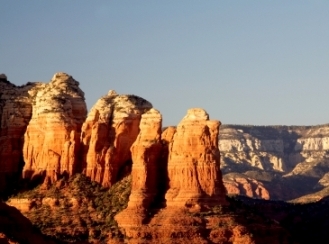 Of all the best places to retire in the US, Arizona is a great pick. The population was just over 6.8 million people in 2016. There are expensive places to retire in the Grand Canyon State as well as inexpensive ones. The scenery is world class and there are many national and state parks to visit. Outdoor recreation is exceptional. If you have been looking for the best Arizona retirement communities Topretirements can help. Updated Sep 2018. The Arizona climate is renowned for being dry and hot - originally many people with hay fever came here to escape. Summers can be brutal, except at higher elevations, with high temperature into the 110's. Winters are mild. Most of the state is desert or high desert. Median household income in 2014 was $49,928 is slightly below national median. Median home prices crumbled in most of Arizona in 2008 and 2009 but have recovered sharply since then. Zillow estimated that Arizona’s median home value was $242,000 in 2018, which is above the national median of $218,000. In Tucson in mid 2016 the median home price was $227,000, while the Phoenix median sales price of a home was $272,000 (Source: NAR). Prices in Prescott, Sedona, and Flagstaff are higher than further south. Arizona has the 25th highest cost of living of all the states according to MERIC. Tax Burden: Arizona taxpayers pay $3,276 per capita in state and local taxes. Total tax burden in Arizona is the 36th highest of all the states, mostly due to limitations on property taxes. Marginal Income Tax Rates. The top marginal income tax rate is 4.54%. There are no standard deductions or personal exemptions. Retirement Income Exemptions. Out of state pensions are fully taxable, while most military and government pensions exempt up to $2500. Sales Tax: Sales tax rates are generally at 5.6%. Counties and cities can add up to another 5.125% in sales taxes. Property Taxes: There is a personal property tax. Certain property tax protections exist for people over 65. The median property tax is $1356/yr (tax-rates.org). Homestead Exemption. There is a homestead exemption for people over 65 with certain income restrictions. Estate and/or Inheritance Taxes. There is no inheritance or estate tax. Many active adults enjoy living in the huge planned community of Green Valley. Many people decide to RetireinPhoenix, one of the nation's largest and most dynamic cities. Tucson is further south and offers the University of Arizona as well as beautiful mountains and many interesting communities. Check out other great retirement communities like scenic Sedona , Flagstaff, Prescott, or old the artists community of Tubac. Profiles of new active adult communities are regularly added to our database. Arizona does not have a certified retirement community program. To help orient you understand what various towns and cities are like in Arizona, our extensive reviews always contain photos, Google Map, and detailed facts for each retirement community in Arizona (see link to Directory below). Each Arizona retirement community profile features ratings on expenses, age restrictions, taxes, recreation, amenities, transportation, etc. so you can compare how other active adults 55+ have rated that city or development. Discussion Forums help you find out more and even ask questions. Click on the Arizona Retirement Community reviews on the right.